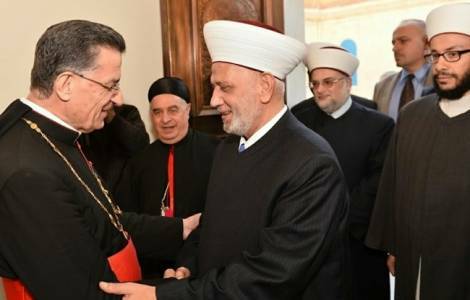 Beirut (Agenzia Fides) - The Middle East will no longer exist if the exodus of the Christians of the East continues to reduce the presence of those bearing the name of Christ in the Middle Eastern countries. The alarm was launched in recent days by Sheikh Abdel Latif Darian, Mufti of the Lebanese Republic, during the ceremony for the delivery of diplomas at the end of the school course to more than 350 students of the Makased institutes, the Lebanese Islamic private schools. "We live in the same Country with Christians, we share the air and the daily bread. We have the same destiny: our future will either be together or not", said the official representative of the Lebanese Sunni community. The Mufti of the Lebanese Republic has also invited young people to take root in their own Country. Regarding Christians, he defined the terrorism of attacks aimed at Christians as a crime aimed at the entire population, but he also criminalized every choice aimed at simplifying the processes and procedures for the emigration of Christians. During the ceremony, held in the presence of government representatives, Sheikh Abdel Latif Darian also invited students to live the day of joy without listening to sad and mean words. Then, referring to the difficult moment non-state schools of Lebanon are going through (see Fides 5/7/2018), he spent reassuring words on the future of Islamic schools, which in his opinion will continue to educate new generations to the healthy principles of citizenship, to the love for the Arab identity and to the sense of brotherhood towards the whole human family. OCEANIA/AUSTRALIA - The Catholic aborigines: "Postpone Australian Day to May 27"
ASIA/MYANMAR - A Bishop: "Rohingya, a matter of humanity. May both parties build peace"